Alhough Gevrey-Chambertin is the largest appellation in the cotes de nuits, we certainly have one of it’s smallest domains. 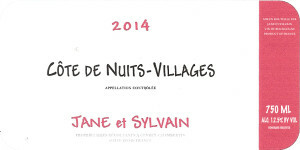 Their wines are in high demand, and we are starting with a small allocation of their Côtes de Nuits-Villages. This is sourced from a unique parcel – next to the village vineyards of both Gevrey-Chambertin and Fixin, it is on the top of the slope, and sits above an old quarry. Specifically, it is right next to Fixin “Queue de Hareng.” Although everyone talks “terroir;” this tiny-domaine making miniscule quantities of wine using strictly organic practices, sourcing from impeccably maintained and ideally located vineyards truly stands out. The Domaine farms using only organic practices to ensure that the grapes, that will be hand-harvested, are healthy and vibrant.